British Lions formed in 1977 following the break-up of Mott. The nucleus of that group – Overend Watts, Morgan Fisher, Ray Major and Dale Griffin – combined with one-time Medicine Head front-man John Fiddler and recorded their debut album, released earlier this year by Angel Air (SJPCD065). The formation of the band unfortunately coincided with the advent of punk rock and in spite of achieving chart and live success in the States, they folded soon after the recording of “Trouble With Women”. This is the album’s first ever release on CD and features numerous bonus tracks. Informative sleeve notes by Dale Griffin and restored cover artwork make this a splendid companion to the earlier releases on Angel Air. ...although different from their first it is still distinctly 'Lions...At long last, Angel Air have released it on CD, and a welcome release it is too...look beyond the original tracks and you'll find some real gems in the bonus tracks...I like this album and it withstands repeated playing. The bonus tracks are a delight, and prove (if proof were needed) that the Lions did indeed have enormous potential and their demise robbed the world of a mighty fine band. 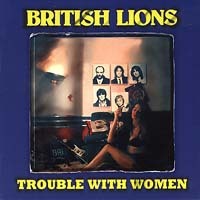 ...the British Lions certainly had their own style and flair and it still shines through on this release. Angel Air has made this release special by adding quite a few bonuses....It is these extras that really make this album worth looking into...For any connoisseur of unsung rare-but-necessary additions to their collection, this is a must-have. As usual with Angel Air, the CD comes with an excellent 16-page booklet wriiten by Dale Griffin...additional recollections by John Fiddler, Ray Majors and Morgan Fisher as well as some great photos. I can't recommend this release enough, I've been playing it to death for weeks and after not playing it for such a long time, I keep hearing bits I don't recall hearing before...It's almost like hearing it for the first time. If you're undecided as to whether to pick up Trouble With Women let me make up your mind for you. Just go out and buy it OK.
...Only nine of the twenty tracks here are from the "official" album, while the rest (excluding three radio promos) are from a couple of live dates, home recordings and demos...if you are looking to be a British Lions completist these discs are for you. In the end the disc is oddly entertaining in its own generic way. British Lions forever!